The Gulf of Poets as seen from Doria Castle in Portovenere. Below is the medieval street, the carugio, lined by pastel houses with tan roofs. The Golfo dei Poeti, or the Gulf of Poets, is the literary nickname for the Gulf of La Spezia that lies on the Ligurian Riviera just south of the Cinque Terre. The area has long attracted artists and writers, many of them well-known such as Percy Bysshe Shelley, Mary Shelley, Lord Byron, D.H. Lawrence, George Sands, Henry Miller and Virginia Woolf. Surrounded by a surreal landscape of dramatic cliffs and rock formations that inspires mood according to the lighting, the Gulf of Poets is truly a bewitching cove accented by crystalline waters. Percy and Mary Shelley came to the area in 1819 and stayed in a white-washed villa named Casa Magni, which was situated on the promenade at the tiny village of San Terenzo. It proved to be a place of inspiration for the both of them. The nearby Lerici Castle was supposedly the setting for Mary Shelley’s “Frankenstein” novel, and it was here that Percy composed some of his most beautiful and famous lyrics and songs. Inscribed on the villa itself are his words, “A lovely house close by the soft and sublime scenes of the Bay of Lerici.” Another inscription reads, “I still inhabit this Divine Bay, reading dramas and sailing and listening to the most enchanting music.” They were often visited by Lord Byron, who resided across the bay in Portovenere. It is said that at least once he swam the 7.5 km across the bay to visit his good friends, the Shelley’s. This was a remarkable feat in itself as Lord Byron was known to have a club foot. Tragically, in 1822, it was in this bay that Shelley lost his life in a drowning accident while sailing his boat, Ariel, from Livorno to San Terenzo. Although a good sailor, he and his two English companions encountered a storm that drove his boat to the bottom of the bay. Shelley’s body and those of his companions were found later washed up on shore. It is believed that his spirit still inhabits the inlets and promontories of the bay. The villages of the Gulf of Poets include Lerici, Sarzana, Tellaro, San Terenzo, Montemarcello, Portovenere, and the city of La Spezia. There are three islands in the bay; Palmaria, Tino and Tinetto. The bay remains vitally active with water sports such as windsurfing, sailing and canoeing. The nearest airports are Pisa and Florence. * Portovenere can be reached by ferry from La Spezia or Lerici. There is a bus from the train station in La Spezia. * Lerici can be reached by ferry from La Spezia, Portovenere, and The Cinque Terre. Ferries run from the 1st of April. There’s a scenic drive from La Spezia, and there’s a large car park between San Terenzo and Lerici. A shuttle bus runs between the two, but it is a short walk to either village. * The best time to visit is Spring or Autumn as the Gulf of Poets can get very crowded in high season. Mary Shelley wrote Frankenstein well before she set eyes on the Mediterranean. Diane, have a wonderful time! Italy is so beautiful…I like La Spezia a lot and a great place to create a home base. Diane, as someone who has been planning trips to Italy for people for the past 20 years, I wouldn’t say that La Spezia is a wonderful place to stay for 8 days. It is not as charming as its neighboring towns. It is only worth staying there instead of in the smaller towns nearby if your budget dictates it. La Spezia does have a historic area and definitely some good eats but the port is just huge with massive tankers. 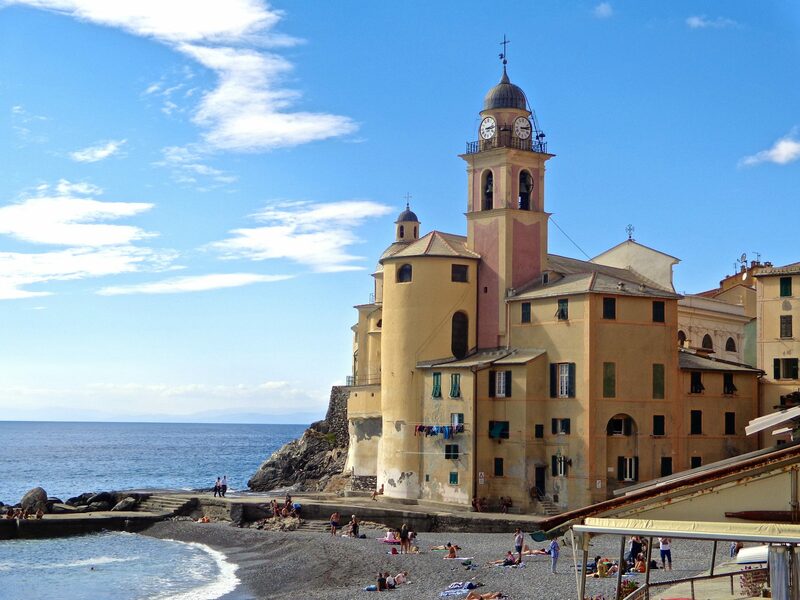 I would recommend staying in a more charming and smaller town nearby, like I said, unless your budget is dictating that you really need to stay in La Spezia. While you may intend to venture to the more charming towns each day, it certainly could get tiring having to travel back to La Spezia daily. Transportation on trains gets very crowded in and out of the Cinque Terre in high season, and if the sea is rough the boats may not go. Having to travel back to La Spezia each day just to sleep can make things feel a lot less relaxing. Chandi has some great points. However, I think you have made a good plan. We used La Spezia as a hub and it worked well for us. It is a working town, not so much to see. But like you said, as well as being out and about as you explore the area, if you find a village that you want to spend more time in, then you can do that. You will be right next to the Bay of Poets, and you will find your lovely bay of bobbing boats and waterfront restaurants at Portovenere, as well as Cinque Terre. Have a wonderful time and I’d love to hear about it when you return. I get you…I’ve had the same thought lately! Hmm… another one to add to my list! Stunning photo, looks like a beautiful place to visit! Have you read Beautiful Ruins by Jess Walter? It’s set in a port city near Portovenere. Great read. Hi Stacy, thank you! No, I have not read that book but I’ve written it down and intend to. Thanks for the recommendation. This Ligurian coastline and bay is amazing. Susan, I loved the detailed history of this area as well as the travel tips. I am adding it to my Italy file for when we visit there. Ciao! Totally agree….history and travel info! Great combo! What do you mean exactly but surreal? Surreal means freakish, bizarre, or oddly dreamlike. I imagine you are intending “oddly dreamlike.” I’m just curious what aspects of the setting there are oddly dreamlike, and do you think this “surreal” quality influenced Mary Shelley’s writing? Hi Bunny, what I meant was understanding this area as very strange or unusual : having the quality of a dream. The rock formations, the little inlets and promontories, just the entire presentation to me. Do I think this oddly dreamlike, surreal quality influenced Mary Shelley? Your guess is as good as mine. But I would assume so if it is true that she wrote her novel “Frankenstein” while living here. Thank you for stopping by. I don’t have any definite answers for you, but only my perception of the Bay of Poets. Another one of my very favourite places. I spent a week in Lerice and San Terenzo a few years ago and loved every minute of it. I know exactly what you mean. The joy of blogs !! !